I’ve had a special interest in this subject matter for a few years now. I’m a dog bite victim – the classic “dog bites man” story, In 2008 I was bitten by a molosser breed dog that I had known for two years. The owner was not irresponsible except in not informing me that the dog had bitten others before me. I was not playing rough with the dog, and the dog was leashed and visiting on my own property. So the hue and cry that only bad ownership or handling of a bully breed is the only possible explanation for a bite would seem to fall flat on its face. My husband cried like a child – it was the first and only time I’d seen him cry. This really scared me, because I hadn’t yet looked in a mirror and had no idea what damage had been done. The neighbour was crying. I however, refused to cry – I felt like someone had to keep it together. My front teeth were loosened by the impact with the dog’s skull, my top lip was ripped, and my nose was partially ripped off. Bites to the face usually also result in a lot of blood loss, due to the large number of blood vessels and capillaries located there. Later, I developed two black eyes. My neighbour cried whenever he saw me for weeks afterward. Even the neighbour’s homeowner’s insurance company agreed that there’s little defensible when the bite is unprovoked, on the victim’s own property, involved a bite to the face that required plastic surgery, all by a dog that had an acknowledged history of biting people. As a result, the insurance company ruled that the doctrine of scienter applied in my case, and they paid me out for pain and suffering. The scienter doctrine was developed as, and remains, a form of strict liability. If the conditions for scienter are found, the liability is absolute and does not depend upon proof of negligence. Unfortunately, dogs have become a real enemy for the insurance industry. According to the Insurance Information Institute, dog bites accounted for more than one-third of all homeowners’ insurance liability claim dollars paid out in 2012, costing more than $489 million, with an average amount of $29,752 per claim. The Canada Safety Counsel estimates that about 460,000 Canadians are bitten by dogs each year. In addition, several recent high profile dog bite incidents have brought the issue to the forefront of insurers’ minds, with some insurers going so far as to refuse to underwrite insurance for homeowners with certain dog breeds. The PBAM evangelists I’ve encountered are far less concerned with dog bite victims and are more prone to screech “discrimination” when told of this latter finding with respect to their own insurance coverage. The mandate of the PBAM evangelists has been to persuade the public that pit-bull phenotypes (for the purposes of this blog post – American pit bull terrier, American Staffordshire terrier, Staffordshire bull terrier, American bulldog and any other pure bred or mixed breed dog that is a combination of these dogs) are just like any other dog and any problems with temperament can be laid squarely at the feet of the owner. In order to push pit bulls into private homes, these evangelists rely on the average person’s general unfamiliarity with the heritability of dog behaviour. It is a fact that every breed of dog results from the human manipulation of inherited physical and behavioural traits, and all modern breeds of dog are what we have designed them to be via artificial selection. This blog post is not about presenting pit bulls and pit bull types as evil dogs to be destroyed at will – we know that statistically the vast majority of pit bull type dogs co-exist with people and other dogs without incident. Yet for a breed(s) that represents approximately 6% of the dog population, they commit anywhere from 70 – 90% of all dog bites. And many PBAM advocates consider these statistical truths to be nothing more than poopytalk by dog-haters. So, many of them are engaged in an all-out war to conceal information or hoodwink prospective adopters about these breeds of dog. 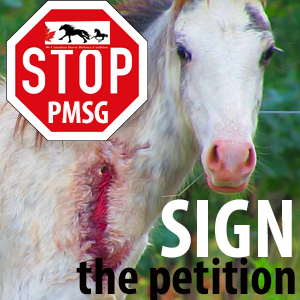 PBAM’s consistently implicate dog owners as solely responsible for their dog’s misbehaviour. While this is certainly often true, we know from understanding population and bite stats that this cannot be the sole reason for bites and fatal attacks. If pit bull types account for roughly 6% of the dog population while simultaneously committing 70-90% of dog bites (depending on various sources), then there must be another explanation beyond poor dog handling skills. 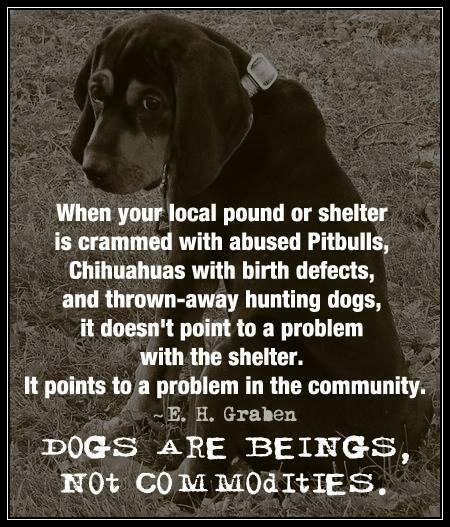 It’s confusing when both professional dog handlers and casual owners recognize genetically predisposed dispositions such as chasing, catching pigs or cattle, killing escaping slaves, chasing foxes down holes, and guarding farm stock, but in the same breath they will tell you that every pit bull down at the shelter is harmless unless it has been raised wrong. To even suggest that a pit bull might come with a different genetic programming than a pointer or a setter is to be accused of “racism.” Which, I might add, is impossible since there are no “races” of dogs. Yet, people will acquire a hunting dog that was bred to kill rats and are then horrified when it displays its genetic legacy by killing a squirrel while off-leash. The dog merely exhibited a behaviour it was artificially selected to do, by man. Just as we bred pointers to point, retrievers to retrieve, and sheepdogs to herd, we bred fighting dogs. Working bulldogs and terriers were used by butchers to hold and control animals for slaughter. The morphological characteristics of these breeds also meant that they were useful in bull and bear baiting. Dogs used for such activities have a physical conformation suited to the task – including large jaw muscles, necks and shoulders, and a body mass that makes defence against an attack much more difficult. Naturally, we expect a breed to behave in certain ways because they were or are bred for specific purposes. In the case of selective breeding, the goal for any desired offspring are physical aptitude and inclination to engage in a behaviour. Sometimes conformation is an additional goal. 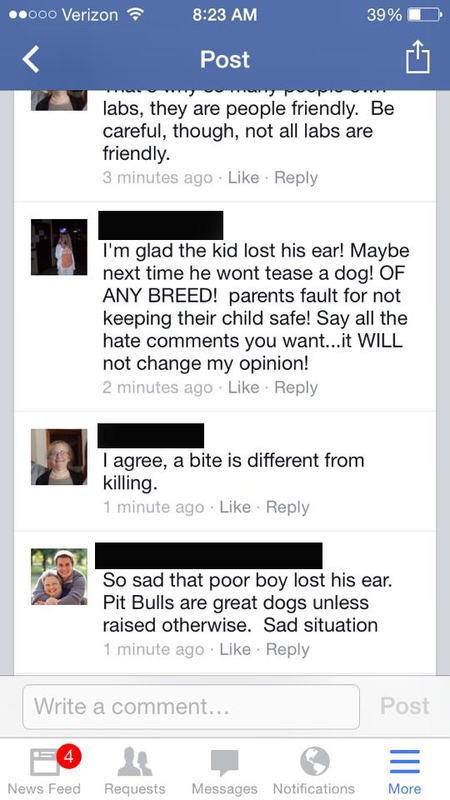 I strongly suspect that a great many breeders of pit bll type dogs are not breeding for appearance or quiet demeanor. There are many unscrupulous breeders who have bred the most aggressive of their dogs, so other behaviours have not been significantly randomized across the breed. Therefore, we have clustering of negative behaviours in pit bull type dogs. Dogs that are bred specifically for aggressive characteristics and for use in negative functions are abusive to the dog and a nuisance to the general public. While dogs generally engage in “ritualized” forms of aggression when they come into conflict (growling and posturing but no real damage) when pit bulls fight they engage the grab-bite/kill-bite part of the predatory sequence with often fatal or near fatal results. There is seldom time to intervene to rescue the other dog (or human) before serious damage is done. It hardly helps that pit bulls are often the most abused dogs – they are often emaciated, chained, or forced to wear prong collars. Quite often they are intact. They are occasionally kept in multiples and are often active in breeding for the financial gain of their owners. Dogs maintained in this manner often do not exhibit the same level of sociability as dogs who regularly interact with humans on a daily basis. So there are often other risk factors involved. PBAM advocates SHOULD be cognizant of these variables, but if they are, they don’t let on. If love and training are all you need, and if aggression isn’t a heritable trait, why do we have such variation amongst breeds? 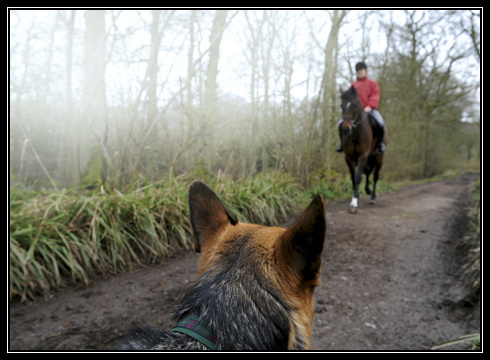 Why is it that we can’t use just any large breed dog as a police dog, or any dog as a guide dog? Better examples of PBAM “logic” are rarely seen than in the Animal Farm Foundation’s “Best Practices” Manual for placing pit-bull type dogs. (The countervailing and more commonsense opinion on pit bulls in shelters, written by the ASPCA, can be found here. The ASPCA document acknowledges that the pit bull aka Staffordshire Bull Terrier is a relatively newer breed. As such, it has a much shorter history of being bred as pets). “Avoid blanket restrictions, such as: No first time owners, breed experience required, fenced yard required, no renters, no adopters under 25” Whatever could be wrong with adopting a pit bull out to someone without no prior dog experience and without a fenced backyard? “Like dogs, children are individuals. Let parents decide what’s right for their children and what challenges they are comfortable taking on as a family.” These vapid idiots really do not understand that the whole point of public safety measures is to protect people from themselves. “If a dog is highly aroused or reactive in his kennel, hang a sheet or other barrier on his kennel door (high enough to block his view, but low enough for adopters to see in). Hang a cheerful sign on the cage that says “I’m friendly, just enjoying some privacy” And if a dog is highly aroused or reactive in his new home, it’s no longer your problem, because you’ve allowed the parents to decide that a highly aroused or reactive dog is somehow right for their children. Pit bulls do have the tools to inflict some serious damage. Plus it seems that most dog owners don’t sufficiently train their animals so everything goes along just fine until the house is full of people and the dog reaches an unnoticed stress threshold. “Just recently, Nevada Humane decided to partner with NASCAR’s TJ Bell to promote “pit bull” dog adoptions” So the absolute worst person to get a pit bull can get another one. “Rather than focus on why a dog wound up at the shelter, their medical history, or what behaviors they need to work on, keep the information upbeat and focused on what the dogs enjoy doing with people. 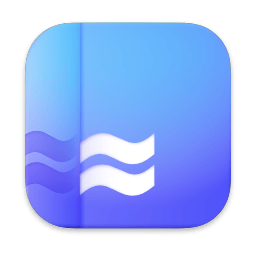 Disclose all known facts to the new owner, including information received from the previous owner” This second statement seems to be contradictory to the previous statement directly above. “There is not a single reportable appellate opinion in which an animal shelter was found liable for a bite by a dog that it did not own” So, transfer ownership of the dog fully to the new owner before it has a chance to bite anyone while under the care, custody, and control of the shelter. 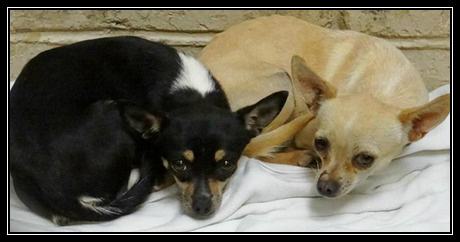 Dolce and Gabbana were two Chihuahuas up for adoption in New Mexico; despite over 900 Facebook shares, they were euthanized due to shelter overcrowding. They had never bitten anyone. But there will soon be a verdict, if it has not already been rendered, against the Blount County Animal Shelter – accused of not advising a family of a dog’s bite history. The dog delivered life-threatening injuries to a young child. In addition to that case, recently, the Stamford Animal Shelter announced that shelter manager Laurie Hollywood had been fired for rehoming dogs with a bite history. Essentially, she did not do her due diligence in disclosing that history to the adopters. Perhaps she was focused on rebranding the image of pit bulls and the history of the dogs she placed was merely an untidy detail that she felt she could overlook. After a dog was surrendered upon having bitten a child, Hollywood adopted him out without disclosing the bite history. He then proceeded to bite the child in the adoptive family. Not once, but twice. In another incident with a different dog, the dog went on to bite the adopter’s wife. In all these cases, Hollywood did not take a bite report nor did she impound the dogs that attacked humans and other animals over several months. Pit Bulls represented 32% of US shelter inventory in June 2014. In another rebranding effort gone wrong, Second Chance Rescue minimized a pit bull’s aggressive traits before handing him over to a New Jersey man for adoption. The dog ended up attacking his two young children. The dog chomped down on his daughter’s leg and nearly tore his son’s nose off just ONE DAY after they brought him home. Seems like the Animal Farm Foundation’s “Best Practice” for allowing the parent to decide prudent exposure to dogs isn’t so great after all, especially when the dog’s history is concealed. As for having your nose almost ripped off, I know what it feels like, and I can hardly wish it on anyone, especially a child. The rebranding of the breed continues to come at a cost to innocent people. As it gains momentum, it becomes obvious that there is an unhealthy obsession in trying to preserve truly aggressive dogs. Not only pit bulls, but other dogs – a German Shepherd with a demonstrated history of aggression, found himself in a North Carolina animal shelter and was scheduled to be euthanized. Although the dog bit a shelter employee twice, the shelter agreed to adopt him out to a local trainer. Sadly, less than two weeks later, in a public park, he seriously attacked the adopter and two other people before he was fatally shot by police. Glad a child lost his ear? 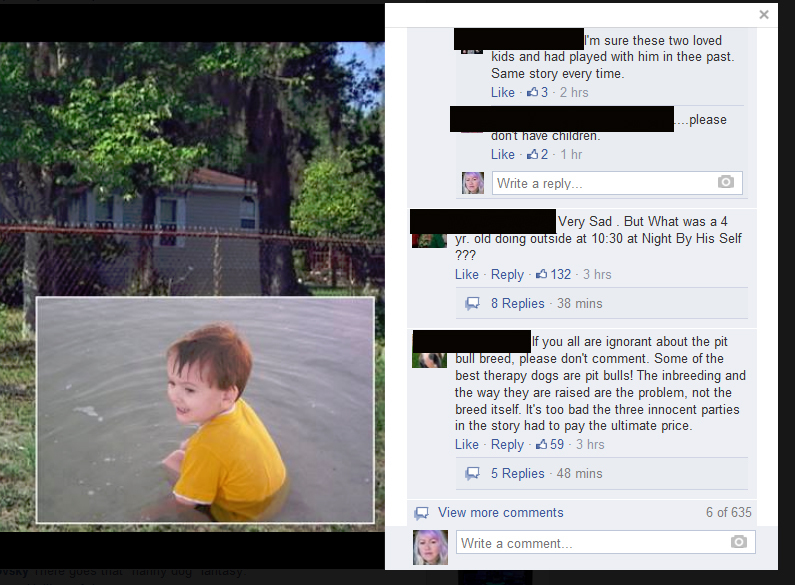 I didn’t even want to conceal this person’s identity – their comments are THAT loathesome. Cesar Millan wanted to save the mastiff cross-breed that killed Diane Whipple. Fortunately he was declined. He also wanted to work with the dog who attacked a small boy in Bakersfield, California. I can only assume that in Millan’s case that ego is the predominant driving force, since most people utilizing a scintilla of reason would probably concur that the most serious of dog attacks against people should result in humane euthanasia for the dog. And why are aggressive dogs receiving so much attention from people who want to save them, when there are thousands of friendly – or at the very least safe and rehabilitatable dogs dying in shelters every day? I admire people’s dedication to animal issues, but these types of efforts seem so misplaced to me. Mickey is a pit bull mix who first killed a puppy, and then cracked a child’s jaw, eyesocket, and cheekbone, requiring the boy to have months of reconstructive surgery, Despite this, more people were concerned with saving the dog than helping the child. There were over 60,000 people pressuring the shelter for his release. Shelters may feel that they are saving lives, but if the dog kills another animal, there is no net gain in saved lives. If the shelter re-homes a dog that they strongly suspect is dangerous, then they are in effect saying that injury or death to other pets or people is preferable to humane euthanasia. The epidemiology of dog bites is also widely critiqued by pit bull activists. Most victims of dog bites are not intruders, but children or respectable adults. While most dog bites are not serious, pit bulls are disproportionately represented in serious mauling cases. A CDC report on dog-bite fatalities from 1978 to 1998 confirms that pit bulls are responsible for more deaths than any other breed (the CDC no longer collects breed-specific information). 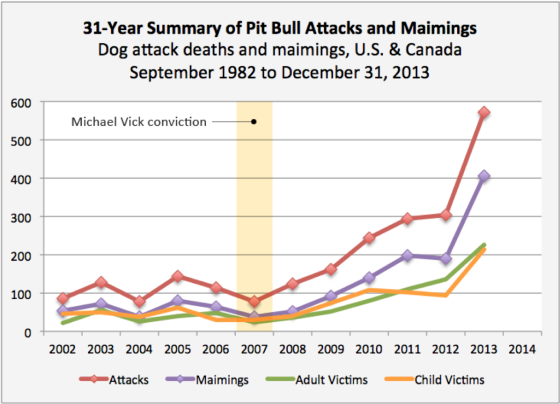 Merritt Clifton has also collated volumes of actuarial information on pit bull bites, and his findings reveal that attacks by pit bulls and their closest relatives still outnumber attacks by any other breed no matter how you spin the data. These are simple facts, and police, public, press, and politicians know it but PBAM elitists can’t or won’t accept statistics for pit bull damage. One of their primary defences is to claim that, unless a dog comes with pedigreed papers or is the known offspring of pedigreed dogs, it can’t possibly be assumed that all these stats reflect injuries by pit bull type dogs. They don’t want you to trust dog geneticists or dog behaviourists either. Definitely don’t trust newspapers. Oh, and don’t even trust your own critical reasoning skills.